As explained in the last blog post, Chef comprises of three main elements – a server, one or more nodes and atleast one workstation. The server acts as a hub that is available to every node. All chef client nodes will be registered with the server. The server holds all the cookbooks, recipes and policies. Clients communicate with the server to get the right configuration elements from the server and apply it to the nodes. The workstation is the development machine from which configuration elements like cookbooks, recipes and policies are defined. Configuration elements are synchronized with the chef-repo and uploaded to the server with knife command. Nodes contain chef-client which performs all the infrastructure automation. After the above step, you can access the web interface by typing https:// from your browser. Because the SSL certificate is signed by an authority not recognized by your browser, you will get a warining. Click on the “Proceed anyway” button. Ensure port 443 is open in the security group associated with the server. Kindly change the default password immediately after logging in for the first time! The first step in setting up the workstation is to install git or any other VCS of your choice. Chef community heavily uses git. # Download and run the client installation script from the Chef website. The Chef package is now installed. The next step is to clone the chef-repo skeleton directory. This will create a directory called chef-repo in your home directory. This is where the entire configuration will be contained. Create a .chef directory inside chef-repo to save the authentication and configuration files. 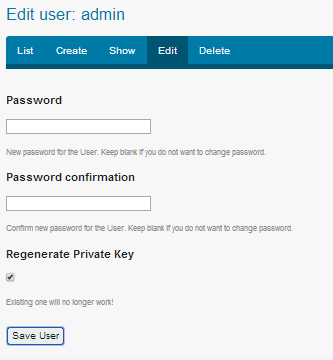 Login to the Chef Server (https://<<ElasticIP of the Chef Server>>) with the admin credentials. Click on the “Clients” tab in the top navigation bar. 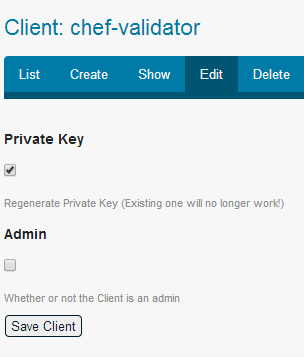 Copy the private key and save it in the chef-validator.pem file in ~/chef-repo/.chef directory. Knife is a command-line tool that provides an interface between a local chef-repo and the Chef server. Knife helps provisioning resources, manage recipes/cookbooks, nodes & more. The command will prompt you for the path to pem files, server URL, username and password. Add the .chef directory to be ignored in the .gitignore list. Setup your email and name with git and add the ruby embedded with chef path to PATH variable. To ensure everything is fine, run the “knife user list” command. It will list all the users. In the next blog, we will look into bootstrapping EC2 instances with Chef.